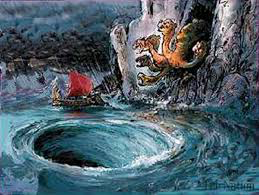 Since 2006-9, governments and central banks believe that they have got through the strait of Messina passing through Scylla and Charybdis but sadly they are mistaken. The world is still desperately trying to get through the inescapable passage that would lead to safety. By printing unlimited amounts of money and thus doubling global debt, there is a general belief that the world has passed the dangers. But sadly that is not the case. We are still in very dangerous waters. Will the world economy be trapped by Scylla, the rock, and incur damages that will have severe consequences for the world economy for years or decades. Or will we be unlucky to be caught by the whirlpool or black hole of Charybdis. Let’s hope not since that would be the end of the world as we know it for a very, very long time. In the Greek mythology, Odysseus managed to pass by Scylla according to Homer. So instead of losing the ship and the crew, Odysseus just lost a number of his men rather than everything by being caught by Charybdis. Hopefully the world will be just as fortunate. Last week I discussed the inevitable trends that the world would encounter in 2018 – a final hurray for stocks, a falling dollar, rising interest rates and higher gold and silver prices as well as higher commodity prices. Well, one week later it is all happening. But this is just the beginning. We are now entering a period when governments and central banks will totally lose control of markets as their manipulation fails. I have long maintained that the laws of nature will prevail and that the manipulation we have have seen in markets in the last couple of decades would fail. In the last week I had an experience that confirmed the power of the laws of nature. This is a power that is so strong that once it is triggered, no government or central bank can stop it however much fake news, trillions of money printing or market manipulation they throw at the problem. Last weekend I was in the Swiss Alps in the village of Zermatt at the base of the famous Matterhorn. For several days we had a relentless snowfall not seen for decades. The snow blocked the access to the village both by train and road for several days. The force of this avalanche was of a magnitude that destroyed everything in its way. This is exactly what we will experience in the world economy and financial markets in coming years. 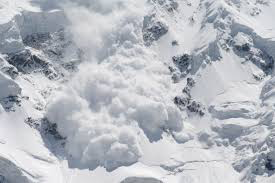 Most avalanches occur spontaneously due to the increased load of snow. Eventually that last snowflake and the weight of the snow triggers the avalanche. Money printing, fake news, and government manipulation has temporarily managed to set aside the laws of nature but eventually the truth will win. The force of the financial avalanche coming will be similar to the the avalanche we just had in Zermatt. It is so powerful that everything in its way will be destroyed. And no human intervention can stop it. At the end of this article there is a link to the avalanche in Zermatt. The truth is that a manipulative elite has managed to totally destroy the natural forces of ebb and tide. There are natural cycles in nature that move gently between peaks and troughs. These cycles are self-correcting without any human interference or manipulation. But there are times in history when mankind want to play god and endeavour to set aside the laws of nature. This is what the world has experienced in the last 100 years with an elite interfering with the natural forces of supply and demand by manipulating the economy and financial markets. They have skilfully done this for a century without taking responsibility for the consequences. In the next few years, the world will experience the repercussions of the disastrous mismanagement of the world economy that governments and the elite have inflicted. We are now reaching the point when lies, money printing, artificial interest rates or any other form of manipulation will cease to have any effect. The sheer force of the avalanche will kill all fake manoeuvres. And as the avalanche crushes anything in its way, it will pulverise the financial system, stock markets, bond markets as well as all markets that have been inflated or manipulated by a crooked elite. This means that banks will either go bust or that the money will be worthless due to unlimited money printing. Stocks will go down by 90% or more in real terms, bonds will be worthless, social security will not exist, pensions will be wiped out and property values will decline by 75% to 95% in real terms. This is the magnitude of the avalanche that the world is likely to experience in coming years. Could I be wrong. Well, I hope I will be. But sadly I fear I will be right. The only question is if governments and central banks can delay it for another few years or if the force of the avalanche is too strong this time. One thing is certain, global debt at $240 trillion plus unfunded liabilities of $250 trillion and derivatives of $1.5 quadrillion which is risk totalling $2 quadrillion can never be repaid. However it happens and however long it takes, the debt must be eliminated. And once it is, all the assets linked to this debt will also implode. But before the implosion, we are likely to have hyperinflation as desperate governments hopelessly attempt to inflate the debt away. The world can never start a new growth phase without first having got rid of the debt. That will inevitably lead to poverty, famine, social unrest, war and misery. But unfortunately that is the consequence of the disastrous mismanagement of the world economy in the last 100 years. If you lose your job, plan how you can survive. There are lots of services that are in demand in a depression. Family and friends are extremely important in difficult times. Create a circle of mutual dependence and trust. There is of course a lot more people can do to prepare. Jim Sinclair has covered it very well in his GOTS (get out of the system) on the JSMineset.com site. All of this might sound depressing. As I said, let’s hope it won’t happen but be prepared for that it could. Remember that the world has survived unlimited crises throughout history and whatever happens in the coming years is not going to be the end of the world. But be prepared for the coming avalanche and try to navigate carefully to avoid the worst risks of Scylla and Charybdis. Remember that bad times have many benefits also. The golden calf or material things become less important. Instead relationships, friendship, and helping others become a priority. This will alleviate the hardship that most of us will suffer. The trends that I discussed in last week’s article are now accelerating. Over the last few weeks, we have seen very significant moves in the dollar index and the precious metals. 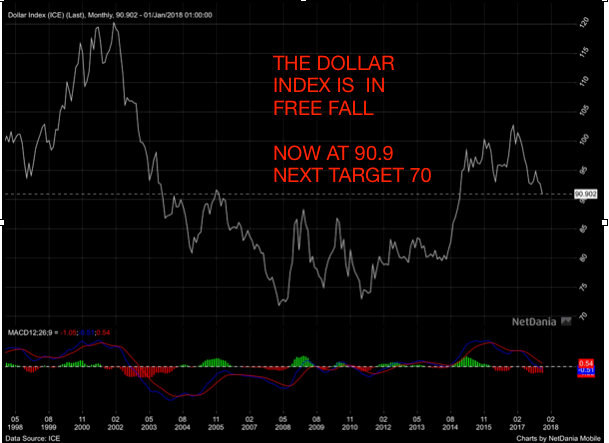 The dollar index is now under 91 and has broken support. Next major support is 70 but that will also be broken on the way to at least 40. Gold is in a hurry and has moved up $100 in the last 30 days. Gold was at $1,237 on December 12th and is now $1,337. 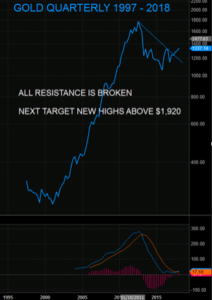 On the quarterly chart, gold has broken all resistance and the next target is new highs above $1,920. That is very likely to happen in 2018. Thereafter gold will reach my old standing forecast of at least $10,000 in today’s money and multiples of that price in hyperinflationary money. Once silver starts motoring, it will move more than twice as fast as gold as the gold/silver ratio moves from 77 currently to 30 where it was in 2011. Eventually the ratio should reach its historical average of 15 which would mean a silver price of $666 when gold reaches $10,000. These targets look sensational today but are definitely not unrealistic. Once the avalanche starts, it will be unstoppable. On its way, it will destroy all resistance including manipulation and the fake and artificial paper markets in precious metals. We will then see the true price of free gold and silver. But investors must remember that physical gold and silver are primarily held as insurance against a rotten financial system for wealth preservation purposes. As all bubble assets implode, gold and silver will be the best protection against the biggest wealth destruction in history. BREAKING News!! Secret Service Agent Just Went ALL IN!! Obama is DONE! !